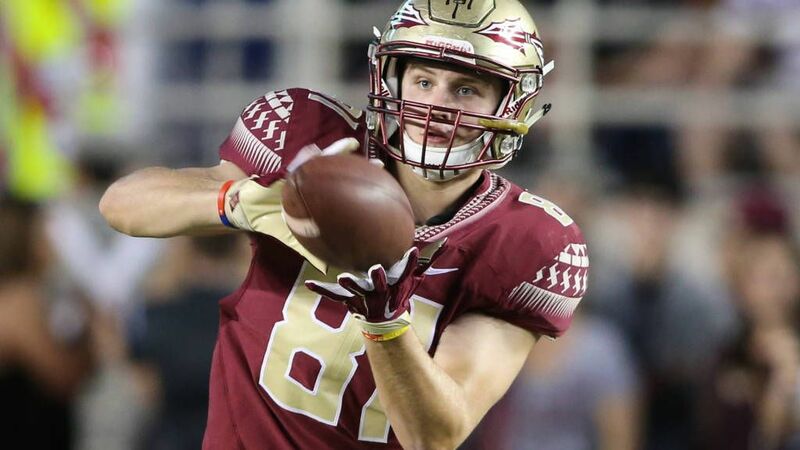 TALLAHASSEE, Fla. – In his first year as a full-time starter, Ryan Izzo turned out to be a fine answer to one of the Florida State football team’s biggest questions: How to replace a tight end who, by virtually any measure, was the greatest in school history? No, Izzo didn’t match Nick O’Leary in 2015. But he wasn’t bad, either. After a redshirt year spent learning the playbook and absorbing instruction from the senior O’Leary, Izzo started 11 of 13 games and caught 14 passes for 210 yards and two touchdowns. That’s more than O’Leary produced as a freshman (12-164, 1 TD), and not far off his pace as a sophomore. And Izzo’s 15.0 yards-per-catch average was second-highest among Seminoles with at least 10 receptions. Now as part of a wave of returning starters on the FSU offense, Izzo has bigger plans for his second act, in which he hopes to increase his role in the Seminoles’ passing game. To that end, Izzo said he hit the weight room hard over the last few months, bulking up his 6-foot-5, 245-pound frame in a way that he believes will benefit him both as a blocker and a receiver. And whenever quarterbacks Deondre Francois or Sean Maguire organized passing workouts over the summer, Izzo made sure to attend. With Francois the likely starter against Mississippi on Sept. 5, a good rapport with a tight end could come in handy against a Rebels defense that allowed just 22.6 points per game a year ago. So far, the results have shown on the practice fields. Coach Jimbo Fisher said after a recent session that Izzo “keeps playing well,” and tight ends coach Tim Brewster can often be heard barking at his charges to watch how Izzo performs a drill before trying it for themselves. “He’s going to be a really good player,” Fisher said in the spring. Izzo caught the national media’s attention last year by earning honorable mention freshman All-America honors from Campus Insiders. And, just a few weeks ago, he was named to the watch list for the Mackey Award, which goes to the nation’s best tight end. That, of course, is the award O’Leary won as a senior. It took O’Leary until his junior year to really emerge (he more than doubled the receiving yardage of his first two seasons) and, by the time he was a senior, he had become one of the elite tight ends in the country. As Izzo enters his third year with the program, teammates believe that he could be on a similar trajectory.